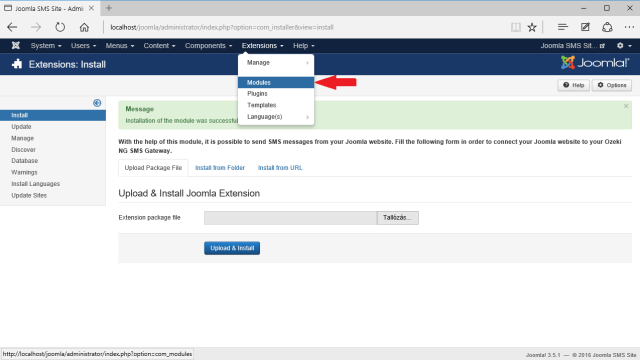 On the Overview page you have read the major benefits of adding SMS functionality to Joomla. 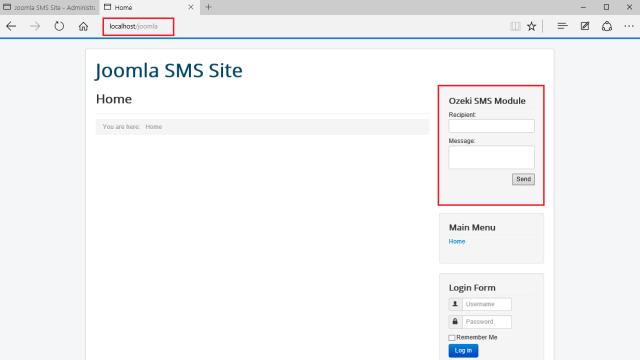 On this page you will get detailed information on how to implement SMS services to Joomla 3.5 web sites with the help of Ozeki NG SMS Gateway in practice. The Ozeki SMS module can be downloaded below on this page. 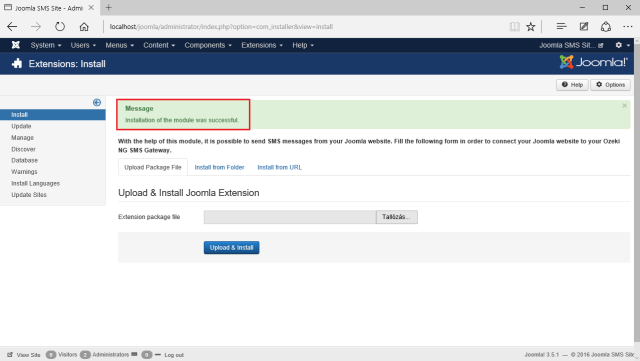 To be able to send SMS messages from Joomla first you need to download and install Ozeki NG SMS Gateway software. You also need to download Ozeki SMS module, as well. After the installation processes you need to follow the steps of our configuration guide below on this page to configure your SMS system. 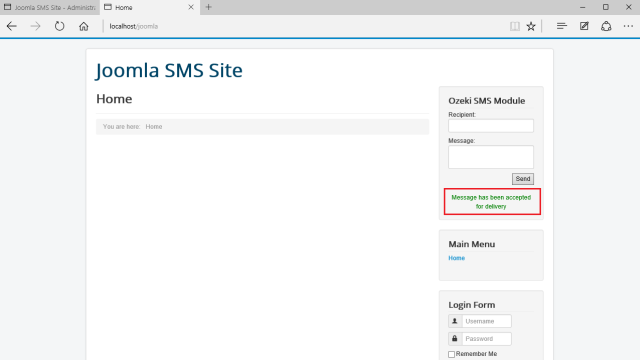 After a few steps of configuration a form will appear on your web site that can be used to send SMS messages. Visitors just need to enter the phone number of the recipient or recipients, compose a message and click on "Send" button to send out the message. 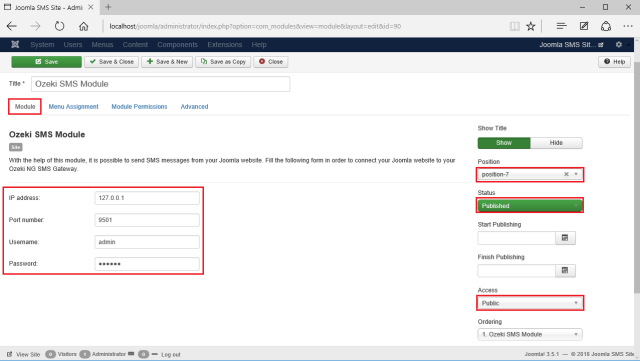 As you can see on Figure 1 Ozeki NG SMS Gateway forwards SMS messages from Joomla web sites to mobile phones. It connects to the mobile network either with a GSM modem attached to the PC with a datacable; or it connects directly to the SMS center of mobile service provider over the Internet (IP SMS connection). 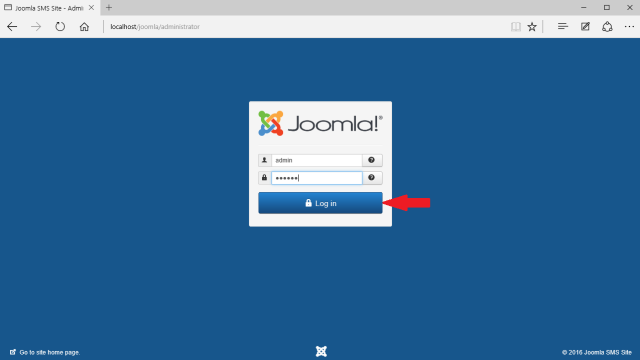 First of all, Joomla and Ozeki NG SMS Gateway software need to be installed on your local computer. (Please find the installation guide of Ozeki NG SMS Gateway on this page.) 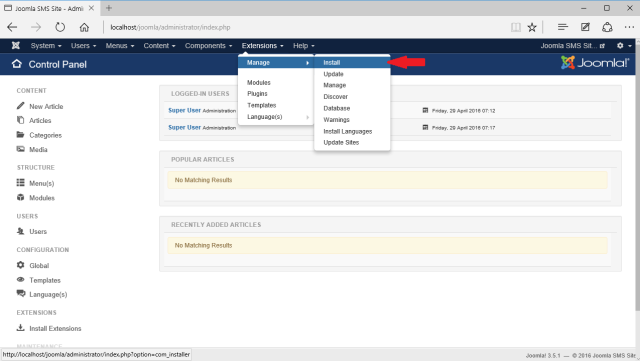 If you have installed them, log into the administrator side in Joomla (Figure 2). 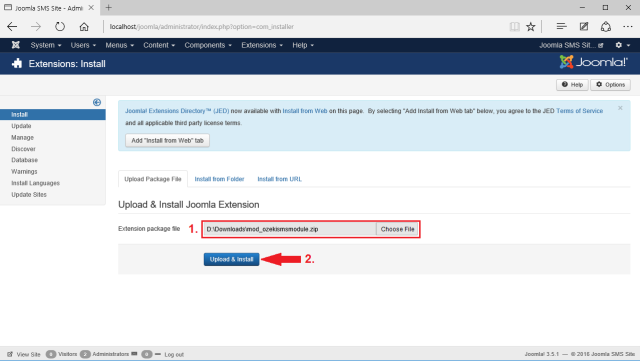 Select "Install/Uninstall" menu item in "Extensions" menu (Figure 3). 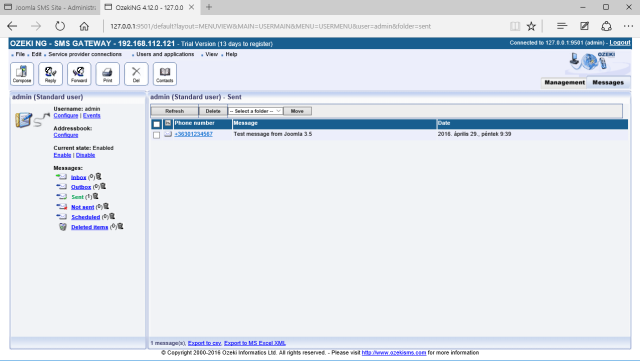 Then browse for the downloaded mod_ozekismsmodule.zip file by clicking on "Choose File" (Figure 3). If you have found mod_ozekismsmodule.zip file, select it and click on "Upload file & Install" button (Figure 4). After the installation, select "Module Manager" menu item from "Extensions" menu (Figure 5). Click on "Ozeki SMS Module" in the list (Figure 6). IP address: - the IP address of the computer to which Ozeki NG SMS Gateway has been installed. As I installed Ozeki NG SMS Gateway to my local computer it will be "127.0.0.1" in our example. Port number: - It is the HTTP Server Port of Ozeki NG SMS Gateway. As I do not change it, it will be the default port: "9501"
Username: - I use the default "admin" user of Ozeki NG SMS Gateway. Password: � I use the default password of the admin user ("abc123"). 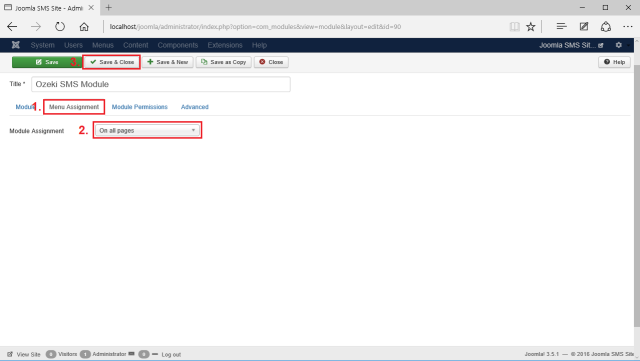 On the right side of the page, select the position (in this guide position-8 is selected), where the module will be displayed, change the status to Published, and specify the access group, who is allowed to send SMS messages (here it is configured to be Public) (Figure 7). 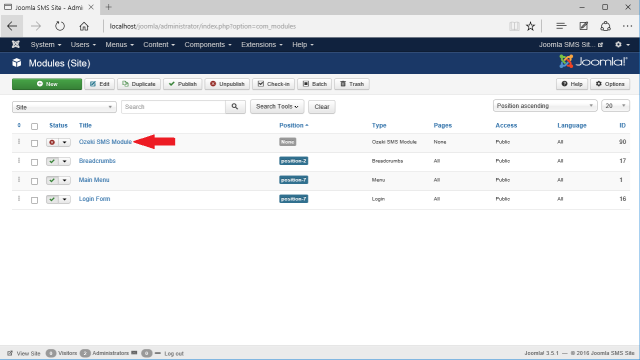 Then under the Menu Assignment tab you can specify the pages on which the module will be displayed (Figure 8). Now on the right side of the front page a form appears. Define the recipient in the form, compose a message and click on "Send message" button to send the message (Figure 9). If the message has been accepted for delivery by Ozeki NG SMS Gateway, the following message indicates it (Figure 10). If you take a look at "Sent" message folder in Ozeki NG SMS Gateway you can see that the message is sent or not sent (Figure 11).